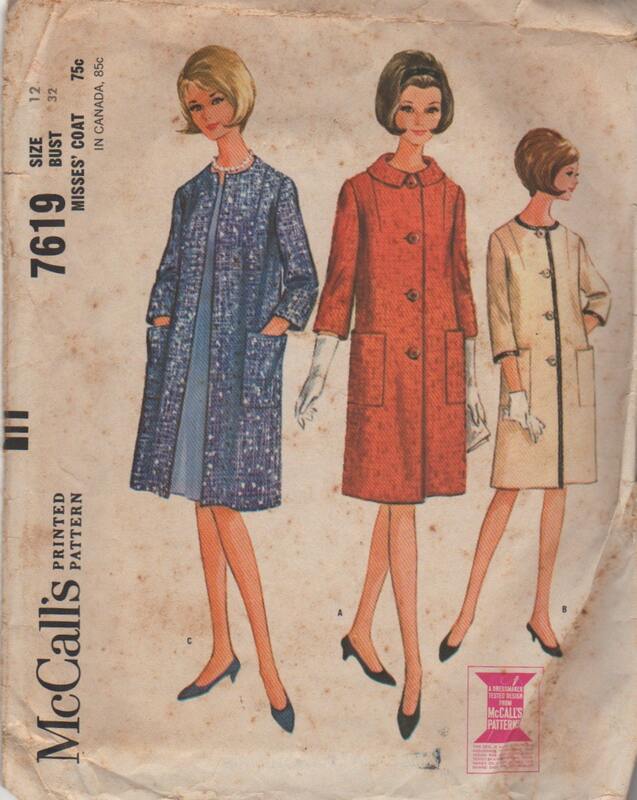 A week or so ago, I bought 3 vintage patterns on Etsy from Miss Betty's Attic on Etsy. I wasn't meant to be buying, merely browsing, but somehow they jumped into my cart and before I knew it, I'd clicked buy! 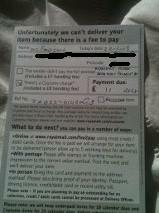 On Tuesday, I arrived back from work to find that Royal Mail had put a card through the door. Apparently I owed them £11.44 due to customs charges. I've only ever bought one thing from the US before (2 vintage patterns previously) and hadn't encountered this, although had heard via other blogs that this could happen. What I didn't expect though was that of the £11.44, only actually £3.44 was for VAT (tax) - the rest - a full £8 - was Royal Mail's handling charge!! I have no issues with paying tax on my purchase (even though it feels a little excessive for a second hand item that I didn't buy in this country) but to pay that much for a "handling charge" - that's just outrageous! I've tried rationalising this, but just can't. Does the "handling charge" include paying someone to come to my house to deliver a card? No, because I can pay 50p for a second class stamp and someone brings it to my home. Is it because of the processing at the sorting office? Nope, because once again, I can pay a couple of quid for a parcel that is too large for my letter box, which will be taken back to the sorting office if I'm not in. Is it because they have to pay the £3.44 upfront and they are therefore charging me some sort of interest? No idea, but this seems excessive. But what else could it be? How much handling can it have undergone to justify this charge - it's the equivalent of banks charging you 20 quid for going 20p overdrawn! But in this case, I have no control over it. No one can tell me how to pay the tax upfront, to therefore avoid the handling charge. The man at the sorting office, was nice and understanding (of my incredulity), but useless nevertheless. So I am left wondering if I just need to avoid buying from abroad in future. I've paid a further 50% of my total spend on this - which, quite frankly, just feels like I've chucked money in the bin! I've heard that generally if you spend under $30, you don't get taxed, but unsure if this price includes postage or not. Anyone have any ideas? How Lovely is By Hand London? This post’s subtitle is “It’s the wrong pattern, Grommit”, but this only works in a Wallace and Grommit voice. On Monday, while the Small Boy was having his afternoon nap, I decided to do some cutting out. I pulled everything out the cupboard, took and uploaded some photographs of my fabric for my last post, and then faffed around a bit. I’m always a bit scared of the cutting process, if truth be told, probably because it’s one of those bits it’s very difficult to go back and fix if you get wrong! And it’s especially scary when you have limited resources of very lovely fabric. For this reason, and out of curiosity for the Charlotte skirt, I decided to start with cutting my skirt rather than my coat. In the Charlotte Sewalong, By Hand London says (as do many blogs, books etc etc) that I should trace my patterns and given that I, somewhat wishfully thinking, cut my Megan Nielsen Kelly skirt in too small a size, I decided to give this a go. So, to my Charlotte pattern. I’d read through the instructions previously, but hadn’t pulled out the pattern, and when I did, I realised immediately that something was amiss. Can you spot it? I have the Elisalex dress inside the Charlotte skirt packaging! As I got the pattern as a gift, I wasn’t sure where my mother-in-law had bought it, so I contacted By Hand London directly. I used their online contact form but as this didn’t illicit a response within a few hours (I am now impatiently wanting to start on this skirt! ), I tweeted them instead. Almost immediately they got back to me, offering apologies and to send out the correct pattern… and the Elisalex booklet to go with my paper pattern too. How nice is that?!! So, now I feel I owe them a FO very quickly and so will be prioritising the skirt over the coat! I do think the skirt will make up very quickly though, and so will be a quick FO hit (hurrah, shiny new thing) and then should get me back into the sewing frame of mind before I next tackle the coat. *Update* - On Thursday (3 days after I contacted them), not only did By Hand London send the promised patterns, but also included, with a lovely hand-written note, a lovely Charlotte tote bag "for good measure". Thank you so much, ladies! In the spirit of blogging about sewing, I thought I’d kick off with what I'm working on just now, and show you what I bought yesterday! The shape is slightly different – the vintage one is more A-line – and it fastens differently, but I don't mind that at all, as it has the ¾ sleeves, the no-collar option and the binding in View B. I bought the pattern, although it’s a size too small for me, as a development/improvement of skills project: first coat, first bound button holes, and most importantly, first attempt at size grading. And then, it lay, in the cupboard for 6 months. Once again, I procrastinated – this is an area at which I excel – scared to death of the whole sizing up thing, and made a number of other lovely things instead! I did spend some time thinking about it, and decided that I would first make the view B, in a lovely impractical colour as a “winter going-out coat” (you know - something to wear over party dresses, that’s vaguely warm), and then, if I had the inclination, another more practical version of view A, to wear to work. Winter approached, and I was in John Lewis for something when I came across this gorgeous fabric. 65% wool, machine washable, for £13 a metre! I didn’t buy it immediately, but when in JL again a few weeks later, went to have a look at it and there was a lot less on the bale, plus a queue of people wanting to buy it. I snapped up a couple of metres there and then – it was just too lovely to miss out on! I decided to copy the pattern onto sturdier paper to begin with, thinking that if I messed up the grading, and decided to give up, then at least I would still have the original to sell on. After doing this (probably not particularly well – I drew round the pattern pieces onto brown paper), it suddenly dawned on me that I hadn't actually measured the pattern. I did this, and lo and behold, it looked like it was probably going to fit. So, this week I made my first ever muslin. Despite the advice of everyone online, I have never done this. I usually just alter as I go, where necessary, and always felt like a muslin was a waste of time and fabric. Generally most patterns seem to fit OK, and if they’re not perfect I don’t tend to worry about it. However this approach has resulted in a few self-made things that I just don’t wear, so perhaps this should be a learning for me? I made my muslin for this coat from sheeting that I bought for the purpose. I guess the weight and feel is very different from the wool, but hopefully it will be fine. Anyway… drum roll… the muslin fits! Hurrah! It’s a bit sticky off and on, but then it’s not lined and I was wearing a cardigan underneath (logic dictating that I will be wearing a cardigan under the actual coat…), and I may just reduce the seam allowances to be sure. So yesterday I went back to JL, and treated myself to some premium lining (£12 a metre!) in a gorgeous emerald colour. With some vintage buttons from The Polished Button (not photographed, sorry! ), I am all set to go! I have altered my plans slightly. I am now planning to go straight to the work version (version A) with the collar. I just feel the fabric suits this better, and given that the party season is over, the need for a going-out coat has lessened! I am aware, that this in no way resembles the original inspiration, but I guess the inspiration has taken me on a journey that will still finish with a fabulous coat. Whilst in John Lewis, I also came across the below wool blend, reduced to £7.50 a metre, that I bought to make a Charlotte skirt with the accompanying lining. I might do the skirt first, because By Hand London are doing a sew-a-long and I've never done one of those before. Plus the skirt will be considerably easier, so less stressful and a quicker win. Or am I just procrastinating again? I decided to write a blog a couple of weeks ago and since then have been putting off putting pen to paper (fingers to keys?). I have procrastinated awhile, pondering names, making things look pretty, reading other blogs (in the name of research, you understand), Googling images and choosing photos, all the while scared to actually write anything! This feels like such a commitment, and it’s one I’m scared of. I’ve been mulling the idea of a blog over in my mind for a few months now, having discovered the world of sewing blogs about a year ago. This blog-world that I’ve explored, got to know and have become addicted to, seems like so much fun – and yet, I can’t help but feel like the new girl trying desperately to fit in with the cool, popular crowd who are completely out of my league! Yet, here I am writing, and about to hit "publish"! I’ve been sewing clothes now for a couple of years. My mum sewed and knitted when I was young. She’d done it herself when young and made her own clothes and wedding dress. And although I “helped”, it was really me following her instructions, and not necessarily learning an awful lot. OK, yes, I learnt how to use a sewing machine and have had one ever since - I got my first hand powered Singer for my 10th birthday, I think? - yes I learnt how to pin and sew, how to press and how to tack/baste (my mum did this religiously with every seam and hem), but I didn’t necessarily learn, or retain, how to make up a pattern. So a few years ago, I dug out my mum’s 10 ton, 40 year old Home sewing machine (it is made of metal and wood. Yes, wood!) and signed myself up for a Dressmaking evening class. I enjoyed it, but didn’t feel like I was learning again and about halfway into the term discovered I was pregnant. So after 2 terms, one skirt (success!) 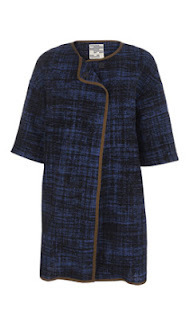 and one maternity tunic (less said about that one the better), I went off to have my son! I have no idea how much time blog-writing is going to take, and as a result have no idea how much I’ll be able to commit. My vague idea is to post about the items I make, but since I sew about one evening a week, progress is pretty slow, so there will most probably be ramblings of other natures as well. So that’s it. My first post! Wasn’t so hard after all!